These are the words I have sitting on a bookshelf in our home. This is what they looked like when I bought them--just plain black. I knew I wanted the color scheme to be bright, so I chose green, orange and yellow. I didn't want to paint them this time, so I searched my stash of scrapbook paper (since I haven't scrapbooked in like 5 years). When I didn't find exactly what I wanted I headed off to the craft store & found these lovely prints. I placed the word face down on the wrong side of the paper and traced the lettering, then cut it out with my xacto knife. I have this lovely Xyron machine which is super awesome for making stickers. I just ran the paper wrong side down through the xyron and voila, the back is all sticky, ready to be adhered to the wood. After I got all the paper attached, I used my trusty Mod Podge and painted a layer over the top to protect the paper. And there you have it. Lovely words customized to match my color scheme :) When my colors change someday I can just put new paper over the top and they'll be brand new again. I love those words you made. Isn't Mod Podge great! Thanks for sharing. These are perfect! I love the paper you choose. I'm impressed! Great job sis! 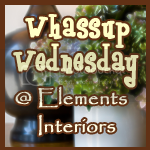 thanks so much for participating in my Wednesday Blog hop! And for posting my button to your blog. Following you now! I'm so impressed with your blog. What an incredible source of ideas and inspiration. Those are gorgeous!! I love making modge podge letters/words. Its fun and easy!! Super cute! I love this idea!! Lookin fwd to following, thanks for entering my giveaway! I will announce the winners tomorrow night! These are very cool, I love inspirational words! Thanks for linking up to Beyond The Picking Fence. I love the word PRAY that you did!!! BEAUTIFUL!! !